Welcome to Stop 28 and Chapter 28 of the CONSEQUENCES audioBOOK blogTOUR! If you’re in a hurry to listen to Chapter 28: SECRETS IN A VELVET BAG, hurry over to LOVE INDIE ROMANCE RIGHT NOW! Me: Run run to LOVE INDIE ROMANCE to find out! Love Indie Romance is the collaborative effort of readers, bloggers, and authors Annie Arcane, Jane Blythe, and Ember Raine, each of whom is a fine romance author in her own right. They were launching the Romance Writers & Readers Group the week that I decided to learn how Good Reads worked, and I am so so lucky that I stumbled into their support group that first week. The group has grown outrageously over the past year or so, and it’s still one of my favourite places to go visit when I need to chill, be amused, or get some colleague support. 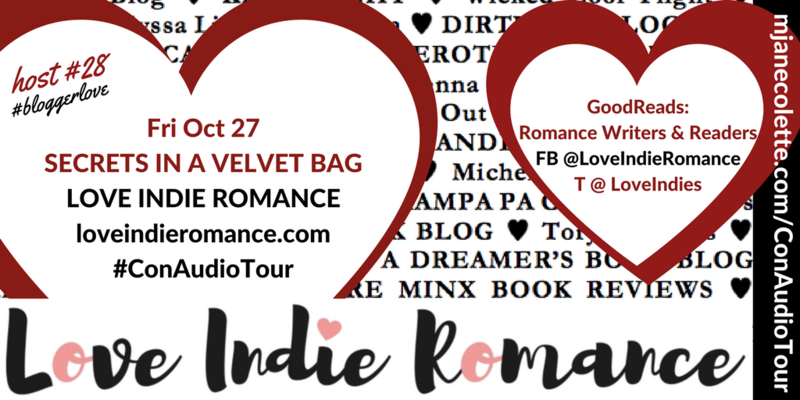 Love Indie Romance is terrific at organizing special events and promos—follow them on their channels to find out what they’re up to next! I am so very very grateful the fabulous Love Indie Romance has accepted my invitations to be part of the Consequences Audio Tour, and I hope their readers enjoy the… provocative SECRETS IN A VELVET BAG chapter. Thank you, Love Indie Romance​, Annie Arcane​, Jane Blythe​ + Ember-Raine Winters​! Now, get thee to their blog, and listen to Chapter 28: SECRETS IN A VELVET BAG.